One common thread that ties so many travellers together is spontaneity. Even those of us who love planning and schedules- me included!- will raise their eyebrows in interest when a great, once-in-a-lifetime opportunity falls in their laps. We do that because, even more than our meticulously detailed itineraries, we love the chance to do something more, to see something more, to be something more than we might if we didn’t take a chance now and again. We know that the world doesn’t follow our rules, and we know that when we bend our rules- even break them- the payoff can be so much better than we ever thought possible. However, if you’re going to throw caution to the wind, consider telling someone you’re about to do so. You know, just in case throwing caution to the wind ends up being more than you bargained for. In 2012, I had a chance to travel to Argentina for work. I hadn’t been there before, so without hesitating I built an extra three days into my trip so I could sightsee and drink Argentine wine to my heart’s content. Two of my three days were planned out quickly, but I wasn’t as fast to fill the third- I was thinking of a day trip, something outside of B.A. so I could see places outside of the city. 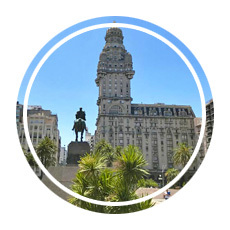 I was intrigued by a 10 hour excursion I found that would take me to Montevideo, Uruguay- an attractive destination if for no other reason than I wasn’t expecting to leave Argentina. The trip was inexpensive, less than 200 USD, so I booked it the day before I left and didn’t think much about it until I was safely in my hotel in Buenos Aires. My trip to Uruguay started early in the morning, long before the first rays of daylight would begin to push away the darkness. 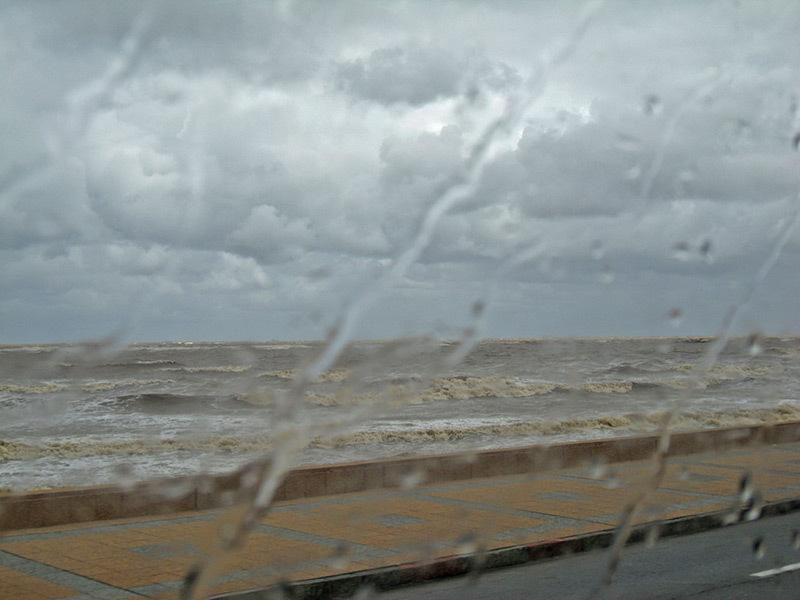 My first stop was the ferry terminal; Montevideo is three hours away by boat, which meant six hours of my day would be spent shuttling across the Rio de la Plata. The ferry itself was enormous, and I spent about ten minutes wandering around acquainting myself with the layout- it even had a duty free shop!- before finding a comfy spot next to a window to curl up and nap until the Uruguayan coastline came into view. I plugged my headphones into my iPod, popped the ear buds in my ears, and was asleep by the time Buenos Aires disappeared from sight. I’m not prone to seasickness, but I woke up about an hour later feeling a bit queasy, like I had been on an amusement park ride that spins you around until you have trouble keeping your balance. I opened my eyes. It was chaos. Absolute chaos. And wow, was it ever dark outside. As I slumbered peacefully, the ferry had somehow steered into a very powerful storm cell. Rain beat down on the windows. The boat tilted unsteadily from side to side. I wondered if I should move closer to the center of the ship. I regretted not staying awake long enough to find out where they kept life preservers. There was a loud crack of thunder, and the boat leaned so far to the left I thought for sure it would just roll over. All around me, people started to scream. Many of them began to weep openly. Two women sitting near me grabbed my hands and began to pray silently. 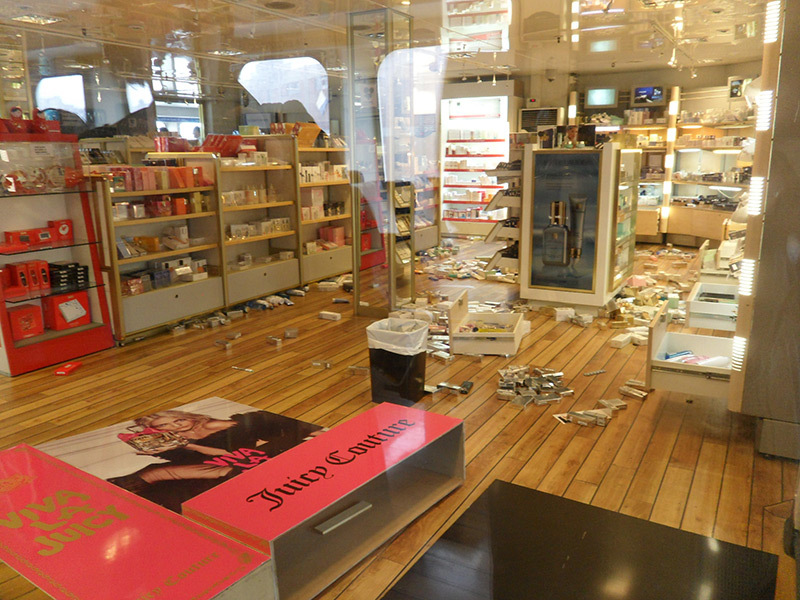 I watched as dozens and dozens of bottles of perfume and cologne crashed to the floor of the duty free shop, and the puddle of scented liquid streamed through the doors and into the main seating area. I wondered if the ship had radioed for help. Duty free as we docked in Montevideo: I’ll pass on the perfume! I also wished I had thought to tell someone- anyone- that my plans for the day included an impromptu trip to Uruguay. I could picture my parents watching the news that night, shaking their heads sadly at the tragedy befallen upon so many people commuting between two faraway countries, not knowing until much later (after I failed to make it to my work meetings a few days later?) that their daughter had been onboard. I realized I hadn’t even mentioned my trip to Adam, who was safe at home. The ship violently righted itself before leaning all the way to the right. I closed my eyes and inhaled slowly and deeply. The women holding my hands squeezed tighter, and I squeezed back. We stayed like that as the boat continued to rock back and forth, slower and slower, until it felt level again. The sun came out. People dried their eyes, sat back down, and resumed conversations with travel companions. 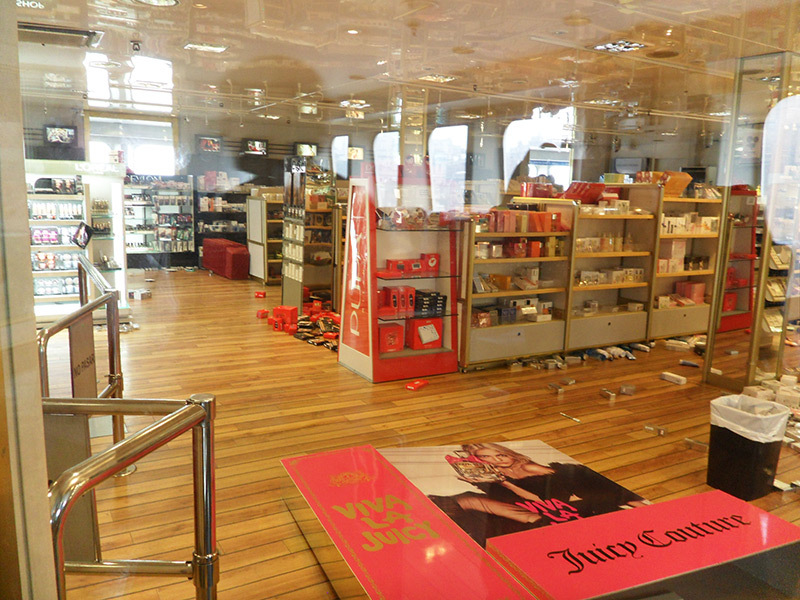 Someone locked the duty free shop and hung a cerrado– closed- sign on the door. Not long after that, the ferry docked at Montevideo. I was more than grateful to disembark- so far the trip was not all I dreamed it would be! By the time we got off the boat, the sun had ducked back behind the clouds and a steady rain fell over the city. 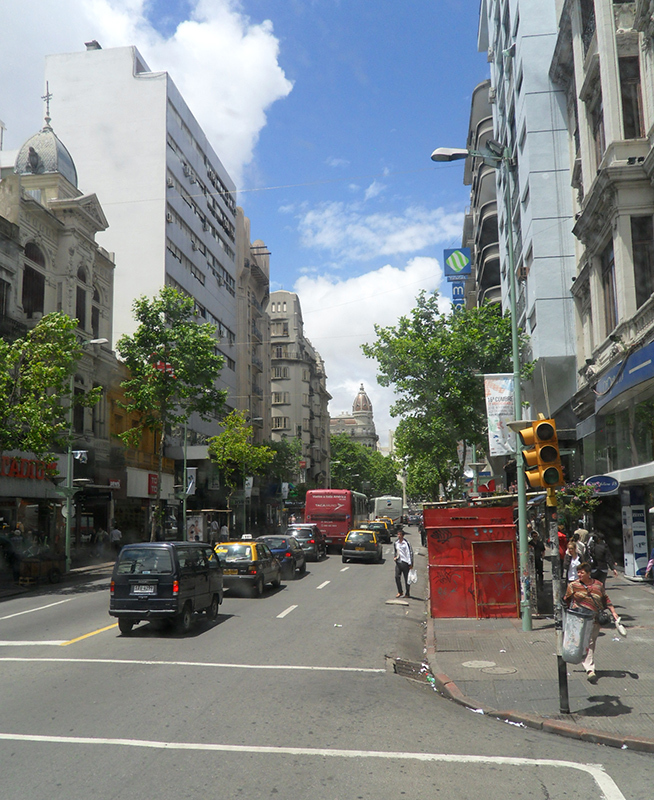 My time in Montevideo, Uruguay was set to begin with a bus tour. Usually bus tours are not my first choice to explore a new place, but I was pretty happy to board a vehicle that was warm and climate controlled as I got my bearings and decided how I would spend my free time in the afternoon. I was also pleased to see the two women I sat next to on the boat; it was comforting to see a couple of familiar faces. The tour of the city was pretty lackluster. The guide alternated between English and Spanish commentary, but Spanish was her native tongue and so she spent much less time sharing information in the language I spoke. 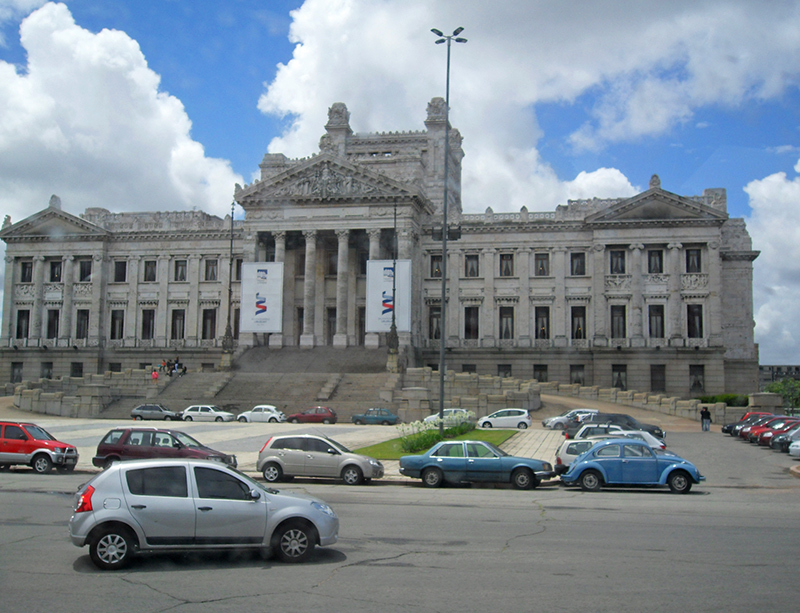 I hadn’t done a lot of research before arriving in Montevideo, so I had trouble distinguishing important buildings and landmarks from my window seat on the bus. We drove around for close to two hours, spending more time than I thought necessary on residential roads with nothing of note to see. When the bus finally came to a stop I was disappointed that I lost two hours that could have been spent exploring on my own. By then it was lunchtime, and I decided I would skip finding a meal and try to see as much as I could. I figured it would be fun to make a few new friends, maybe practice my Spanish, and tour the city as part of a small group instead of alone, so together the three of us started off. When we got to the end of the block, they each took one of my arms and walked me into… a mall. “¡Tenemos comer almuerzo!” they told me. They wanted to eat lunch. I was hoping I wouldn’t waste time on food when there was so much to see, but we quickly found a food court. On one side I noticed a Uruguayan barbeque restaurant, and I thought it wouldn’t be so bad to try something at least close to local cuisine. I pointed to it. “¡Delicioso!” I said. They laughed, took my arms, and led me to… McDonald’s. “Americanos gustan McDonald’s,” they said. I didn’t need a translator for that one. Thanks to the language barrier, I didn’t know the words to say I’m not really a fan of fast food burgers- or anything I can eat when I’m home for that matter- and so the lunch I didn’t want to eat ended up being chicken nuggets and French fries. In case you’re keeping score, chicken nuggets and fries taste exactly the same in Uruguay as they do in the United States. As lunch drew to a close, my new friends again took my arms (I started to wonder if they were afraid I would wander away if they didn’t physically hold onto me!). They led me out of the food court and further into the mall. Oh no. They wanted to go shopping. Vacation. New clothes. Got it. The next hour of my dwindling time in Uruguay was spent browsing through clothing stores and plotting my escape. My new friends- or were they kidnappers?- were not easily distracted, and I waivered between wanting to make a mad dash for the nearest exit and wanting to be sure their feelings weren’t hurt. They seemed to feel protective of me- maybe because of the near-death experience we shared on the boat- and when I finally communicated that I was leaving the mall they seemed very sad and concerned for me as I ventured into the city alone. I ended up with an hour to myself, which wasn’t enough time to see a single thing of interest; the mall wasn’t close to some of the main attractions I hoped to walk back to find, and a cold rain once again descended onto the city. Soaked and frustrated, I boarded a bus back to the ferry terminal to begin the long journey home. At least the day couldn’t get worse. The 6 PM ferry was late. I figured something was wrong when, by 5:30 PM, there was no ferry in sight to take us back to Buenos Aires. At 6 PM, the waiting area was packed with people. No one seemed particularly concerned, and I decided not to worry much myself. Maybe delays were common; if no one else was upset, I wasn’t about to let it get to me either. 7:00 PM came and went. So did 8:00 PM. People started to get restless. It seemed a two-hour delay was, in fact, out of the norm. Finally, at close to 8:30 PM, an announcement came over the loudspeaker. Mercifully, it was repeated in English: the ferry to Uruguay would arrive shortly, and we would depart by 9:00 PM. I forgave the fact the ferry actually arrived at 9:00 PM and we set sail at 10:00 PM; this time, the ride was smooth, the contents of the duty free shop stayed put on the shelves, and all passengers arrived in Buenos Aires safe and in one piece at 1:00 AM. Of course, I wasn’t so lucky as to have my bad luck end there. I returned to my hotel and spent the next three hours tossing and turning as a party raged below my window. Just as the loud miscreants finally tired and started to head home, my alarm went off. It was time to shower, pack, and head to the airport for my flight to Mar del Plata. Lucky me. I wish I could say that my day in Montevideo, Uruguay had been all that I wanted it to be, but I did learn a few valuable lessons. Always let someone know where your travel plans take you; you never know when your ferry might sail into a storm. Meeting new people and making friends can be wonderful—but make sure your goals align with theirs! I’m hoping to make it back to Uruguay in the future. 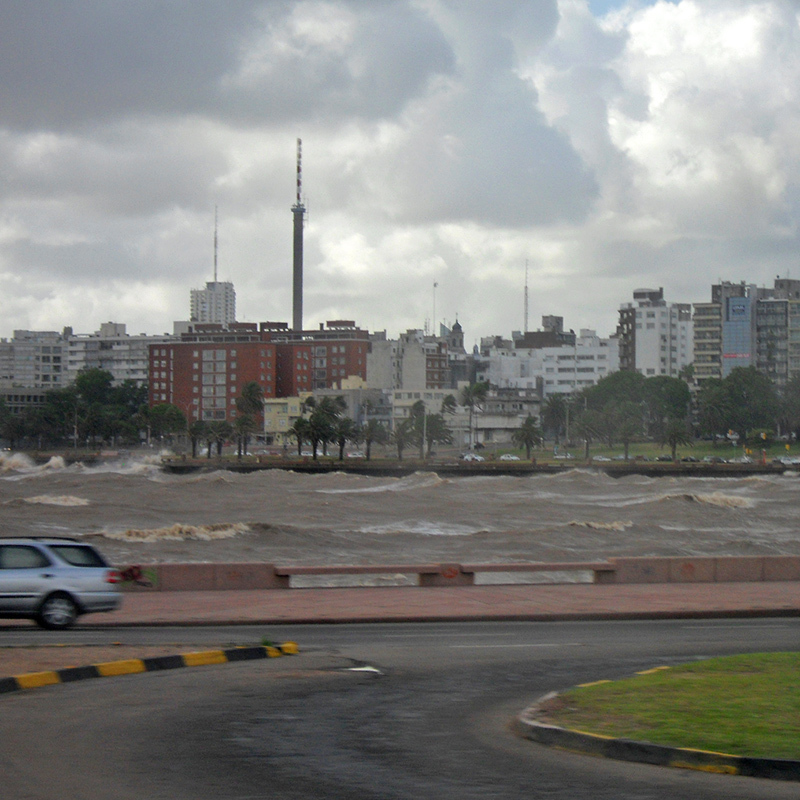 I feel like the Montevideo, Uruguay deserves a second chance, and both Adam and I want to see more of the country. When I have the chance to plan my next journey, though, I might pass on taking the ferry. 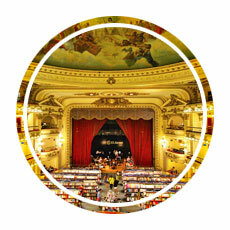 Visiting Montevideo? 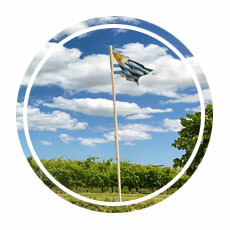 Here are a few more posts to help you make the most of your time in Uruguay and beyond!